Sri Nerode was born to a Vaidya family of Bengal, British India. In this family flows the intellectual blood of the Brahmins and the militant blood of the Kshatriyas. He was raised in a community in which all men and women were cultured. He was educated to the highest idealism and philosophy in his family Ashram in Paraikora by his famous Yogi grandfather Govindra Chandra Roy, his Uncle Prasanna Kumar Roy, and his beloved mother Rashamayee Chowdhurani. He learned the ancient wisdom with such illustrious masters as Dharmapala, Naryan Swami, and others. He sat at the foot of Ghandi and Tagore. Sri Nerode was a graduate of the University of Calcutta with a special degree in Sanskrit. He traveled as an itinerant Yogi throughout India, Burma, Southern China, then came to the U. S. for graduate study at Harvard and Berkeley in 1920. He was a Christian minister who believed in the seamless unity of Eastern thought with Western religion. He traveled and lectured widely till 1950, when he settled down in Chicago. He had taught Yoga for 73 years when he passed away in 1983. He left many books and manuscripts, two of which I have published and others of which I will publish in the near future. I have been given extensive help in this project by Priscilla Alden Walker of Amrita Foundation, Dallas, Texas. 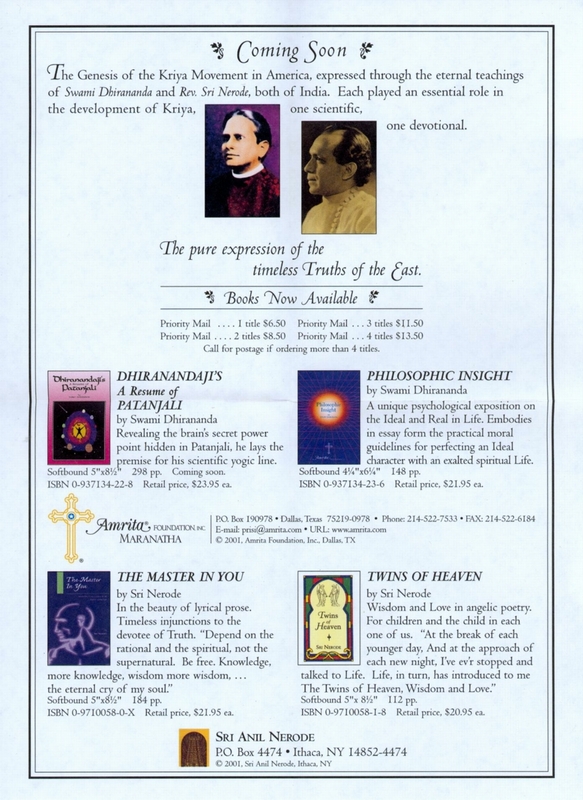 She is publishing, along with other early writings on Yoga in America, the works of my father's friend Swami Dhirananda (Kumar Bagchi). Here is the publication announcement. Some of my friends who know only my scientific work and also those in modern yoga with no historical background will wonder at my using the title "Sri" in this announcement. In explanation, I was given it by Swami Yogananda in his East-West magazine when I was very small because I was an exemplary Kriya Yoga student. I took the first Kriya initiation at four. All seemed easy at that time. If the adults could master these things, so could I! Yogananda and my father were my Yoga teachers. East West MAGAZINE January, 1934 VOL. 6-3 Brahmacharee Nerode will henceforth be called Sri Nerode. Brahmacharinee Nerode, his wife, who is also a Yogoda worker, will be called Srimati Nerode, and their little son, who has been initiated to Yogoda, will be known as Sri Anil.